You can avoid the flushing side effect of niacin with niacinamide and possibly pick up some skin perks, too. Niacinamide is often added to cosmetics for its ability to regulate oil flow, fight wrinkles, and reduce redness. Niacinamide is usually recommended over niacin as a supplement to treat pellagra (vitamin B3 deficiency) because it avoids the common side effect of flushing associated with niacin. However, because B supplements can result in toxic levels, it’s wise to consult your doctor or a nutritionist before adding any type of niacin supplement. Niacinamide is not just a nutritional supplement, however. The cosmetics industry has embraced niacinamide as a topical. As a moisturizer, it’s used to combat aging and reduce rosacea. It is also widely used in a gel form to fight acne. Ironically, it was through the use of niacinamide in people suffering from true B3 deficiency that its ability to help with skin and as an anti-aging ingredient was found. 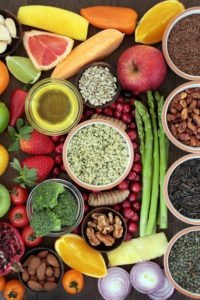 Rarely do we have a vitamin B deficiency, technically called “pellagra,” because most people’s diets include foods rich in B vitamins or B-vitamin fortified. Since B vitamins are water-soluble, they are not stored in your body and must be replenished daily preferably through food. Pellagra most often occurs in people who are alcoholics or on a diet low in wheat, eggs, beef, poultry, or other niacin- or tryptophan-rich foods, according to Taber’s Cyclopedic Medical Dictionary. Treatment is an adequate diet with niacin or niacinamide. Niacinamide is becoming a popular natural remedy for anxiety. A groundbreaking case report published in 2004 discussed a patient who moved from a pharmaceutical anti-anxiety medicine to niacinamide. In “Niacinamide’s Potent role in Alleviating Anxiety with its Benzodiazepine-like Properties: A Case Report,” author Jonathan E. Prousky, N.D., FRSH, described the stages his patient went through, trying various medicines and natural remedies for his anxiety. This isn’t a suggestion for consuming too much niacinamide for anxiety. In excess amounts, it can cause nausea, cramps, diarrhea, and vomiting. Stick to recommended levels, and always consult your physician. A study from Jackson Laboratory, published in Science, found niacinamide prevents glaucoma in laboratory mice. They used mice genetically predisposed to glaucoma and added niacinamide to drinking water. The vitamin was surprisingly effective, eliminating the vast majority of age-related molecular changes and providing a remarkably robust protection against glaucoma. According to the University of Maryland, niacinamide may help protect the pancreatic cells that make insulin, making it a possibility for type 1 diabetes, at least for a short time. More research is needed, and the protection does not move over to type 2 diabetes. In fact, too much niacin can raise blood sugar in type 2 diabetics. In a preliminary study, niacinamide increased joint mobility to the point that the subjects could take less non-steroidal anti-inflammatory medications (NSAIDs) to control arthritic pain. Again, this possibility needs more research. Interestingly, niacin—but not niacinamide—can help lower blood cholesterol and has cardiovascular benefits. The University of Maryland made the point that many of the findings involving benefits of niacin are from dietary sources rather than supplements. Foods high in niacin include protein-rich turkey, beef, and salmon. Fortified cereals, power bars, and energy drinks also provide even high vitamin B amounts per serving. 2 diabetes, acne, aging, anti anxiety, anti inflammatory, anxiety, arthritic, b vitamins, blood cholesterol, blood sugar, cardiovascular, cholesterol, cramps, dementia, depression, diabetes, diabetics, diarrhea, diet, energy drinks, food, glaucoma, insulin, mobility, natural remedies, natural remedies for, natural remedy, natural remedy for anxiety, niacin, niacinamide, nsaids, pain, poor circulation, protein, remedy for anxiety, report, rosacea, skin, sugar, supplement, supplements, tryptophan, type 1 diabetes, type 2 diabetes, vitamin, vitamin b deficiency, vitamin b3, vitamins.